Does anyone have the right to destroy a Global Heritage? | The Linda Tucker Foundation Does anyone have the right to destroy a Global Heritage? Linda with Koisan leader, Chief Stephen Fritz, on the steps of Parliament. 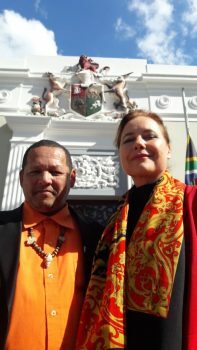 These words, delivered by Chief Stephen Fritz, the First Nation of First Nations representatives, on behalf of the Koisan people, resounded through the assembly at the Parliamentary Colloquium last month – an urgent parliamentary review called by the Chairperson of the Portfolio Committee for Environmental Affairs to assess the damage caused by South Africa’s captive lion breeding and killing industry. It is significant that the words, meaning “the struggle continues”, were delivered in a language of a cultural heritage that has all but been lost to the modern world. Given the international crisis surrounding this issue, there is a real risk that, as a species, Panthera leo could become a lost heritage. For the Global White Lion Protection Trust, a leading international community-based conservation organisation with two decades of engagement in legislative processes regarding the management of lions and other large predators, these words uttered by our First Nation representative, were particularly moving. As the name of this community-based conservation organisation suggests, the founding objective is the protection of South Africa’s critically rare White Lions as a unique conservation and cultural heritage. The captive lion breeding-for-killing industry threatens the survival of all lions but particularly the rare White Lions of Timbavati who are significantly more vulnerable: as a unique conservation and cultural heritage. This genetic rarity revered by the Tsonga and Sepedi people originates from only one wildlife area on our globe: the greater Timbavati region in the epicentre of the UNESCO-declared Kruger to Canyons Biosphere. However, long before UNESCO and the UNITED NATIONS started creating World Heritage Sites, many hundreds of years before the proclamation of the Kruger and other national parks, African kings in fact declared this area a protected “Sacred Site” due to the rare occurrence of these magnificent beasts, King of Animals. Why did we abandon the wisdom of our forefathers for the brutal mechanics of our current legislative structures which turn our magnificent natural living heritage into dead commodities in cross-border deals? Are we really prepared to stand by and witness the destruction of a living legacy and watch the remaining pieces handed over as a dis-inheritance to South Africa’s future generations? Saving lions is not a luxury: it is both an ecological and cultural necessity. It’s encouraging, therefore, that the Chairperson Honourable Mohlopi Philemon Mapulane is finally calling the Department of Environmental Affairs (DEA) into account. The DEA’s mandate is “to have the environment protected for the benefit of present and future generations”. There are two recent events, however, that highlight the DEA’s gross mismanagement of legislation around the protection of Panthera leo. 1. The first was the DEA’s announcement, in July 2018 that it would double the quota of South African lion skeletons for the lion bone trade to Far Eastern markets, bringing the figure up to 1,500. These are lions that are bred in captivity, hand-reared and cuddled by tourists, before being left to starve to death or slaughtered for their body parts. 2. The second event was the scandal over the trophy hunt of a magnificent lion, allegedly a famous pride male named Skye. The hunt took place in Umbabat, one of the Associated Private Nature Reserves (APNR) surrounding the Kruger National Park, which has opened their fences to our national park, and national game. In the first case, the Colloquium investigated the drastic changes in South African lion management policy following the astonishing Supreme court ruling in Nov 2010), when the government’s efforts to prohibit the captive lion industry were overruled in favour of The Predators Breeding Association appeal, the proponents of the captive breeding-for-killing of Lions. Since this time, South Africa’s lions have been systematically decimated by this captive breeding-for-killing industry, a newly formulated methodology of exploitation of wildlife, which has no precedent in international conservation legislation. The ground covered by the Colloquium was not always palatable, and uncomfortable questions were raised around the shadowy links between trafficking, traders and crime syndicates. Many of the findings published in comprehensive reports by investigative animal rights organisation, EMS Foundation, reveal that the captive lion breeding industry is run by criminals, who are well known on Interpol lists. With entrenched vested interests at multiple levels in these cross-border dealings, it appears that illegal poaching and legalized trade are inextricably linked. The murky grey area between legal and illegal dealings goes back to the initial establishment of these captive breeding-to-kill facilities on the borders of our natural parks. In the second case, that of the Lion commercially trophy hunted in the APNR, questions first arose after bait was used to lure the lion to be shot by an international trophy hunter, an unethical practice in trophy hunter’s code of conduct. 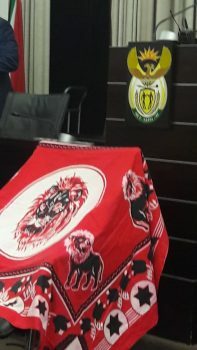 On the back of this, further questions arose about the identity of the lion: was this a neighbouring Kruger lion, lured from protected territories into privately-owned land, just as CECIL was lured from the safety of Zimbabwe’s Hwange National Park in 2014? Or was this a pride male called SKYE, well-loved by visitors to the private nature reserves? Either way, it was a breach of hunting protocol, as hunting of pride males is known to have devastating ecological consequences and is forbidden. Suspicions were intensified when Umbabat refused to allow the lions’ body to be ID-tested. When asked by the Chair why the carcass was not made available for identification, the DEA referred to antiquated legislation, maintaining that once an animal is killed, it becomes an object “owned” by the hunter. This was nothing more than a sleight of hand feeding into in a circular argument; if an animal is stolen before being hunted, the hunter is obviously not within his rights to own the trophy and how can the truth be ascertained except by examining the body. Given the APNR’s privileged location as “Buffer Reserves” directly bordering onto our protected area of the Kruger National Park, one would look to these private nature reserves to set a standard of trophy hunting ethics and code of conduct. Unfortunately, their track record over the decades is not a pristine show-case. Furthermore, given that the APNR is the endemic habitat of the critically rare White Lion, the question of hunting ethics is all the more critical. 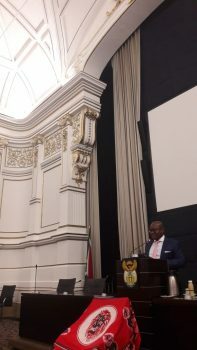 During the Colloquium, the APNR asked why trophy hunting on the private nature reserves was under scrutiny when the title of the Colloquium was: CAPTIVE LION BREEDING FOR HUNTING IN SOUTH AFRICA: HARMING OR PROMOTING THE CONSERVATION IMAGE OF THE COUNTRY. Although the connection may not be obvious, the two issues are integrally connected. Firstly, one has to ask how the “Canned Hunting” (captive breeding-to-kill lions) facilities set themselves up in the first place; and secondly, how they were legalized by the DEA to conduct these activities. It has been established that the White Lions, and golden lions bearing the rare White Lion gene, were forcibly removed from their endemic habitat of the APNR over many decades. This occurred, not only through the commercial trophy hunts which have been taking place within the private nature reserves themselves but also through the first Canned Hunting facilities, which were set up on the borders of the APNR. Lions were removed from their natural system into these facilities through nefarious means. Every lion in this region could be a bearer of the rare White Lion gene, and therefore the hunting or removal of any lion in the region threatens the survival of this endangered living heritage. It’s likely that the most recently hunted lion is one of the last surviving carriers of the White Lion genetic code. A simple procedure would have determined whether the hunted lion was one of the last surviving gene-bearers since the White Lion “Genetic Marker” was recently discovered. But no one can prove this for certain until the body of the trophy hunted lion is made available for genetic testing. The Genetic Marker which makes the White Lions unique was identified in 2013, after 6 years of collaborative scientific research led by the Global White Lion Protection Trust together with laboratories in 7 different countries. Such an important genetic finding has been used by other governments to declare protected status of unique animals of national importance, as in the case of the Canadian government which protected the snow white “Spirit Bear” of British Columbia (Ursus American Kermodei) as an important ecological and cultural heritage to the indigenous nations of the Great Bear Rain Forest region. This is the opportunity being offered by the Colloquium in reviewing the current crisis in lion management policies, offering Parliament a historic turning point to call not only for the prohibition of the current captive breeding-to-kill industry, but to follow through on their promises to protect South Africa’s unique White Lions as a living heritage in the wilds of their endemic habitat. It is important to recognize that the processes originally followed by Government were committed to ensuring the survival and well-being of this unique White Lion heritage, both a national and global heritage. As long ago as 2006-2008, the Global White Lion Protection Trust flagged up concerns about artificial removals White Lions and gene-bearing lions in their endemic area of the APNR, which prompted a Parliamentary Meeting of the Portfolio Committee of Land and Environmental Affairs on 20 Feb 2008. The Chairperson assured the Trust representatives [Global White Lion Protection Trust] that the Committee fully supported their efforts and would ensure that the white lions were protected by legislation. He advised that the National Parks must be prepared to answer for their failure to present to the Committee. He added that the protection and conservation of the white lions had to be treated as a matter of urgency, given its conservative, eco-tourism and cultural value. One year later, the South African Government’s position was ratified and supported at an international world wilderness congress (Wild9) held in 2009, attended by delegates from 51 countries, where a RESOLUTION was passed to have the White Lions listed for protection by international governments “and all appropriate bodies worldwide”. This RESOLUTION was tabled by indigenous nations from around the globe and endorsed by multiple scientific/and conservation entities, including the Worldwide Indigenous Science Network, and the Global Big Cat Alliance. In that same year, underlining Government’s responsibility towards conserving South Africa’s rare White Lions as a living heritage, the Bloemfontein High Court ruled in favour of the South Africa Government to prohibit the practice of captive breeding-for-killing of lions (then termed: “Canned Hunting”). However, the Government’s position was overturned by the unprecedented Supreme Court ruling in Nov 2010, which effectively dished our lions up on a platter to the captive breeding industry and the consumptive lion bone trade. Our rare White Lions run the risk of becoming myths or legend rather than a proud living heritage for South Africa’s next generation. The ROAR from the First Nations in Parliament resonates with the hearts of anyone from any culture who treats Nature with love and respect. To A Tama !Khums Ge….!! Amongst numerous references, see Chris McBride, Operation White Lion and White Lions of Timbavati.